CMP, CMC and MOSIS have announced a multiproject wafer run for Jan 2011. MOSIS has been known for years as a supplier of prototype IC runs through its global network of foundry partners. CMP is a broker for IC and MEMS low volume production. CMC is a non profit that supports microelectronics and Microsystems R&D in Canada. Patti indicates that the multiproject run opens the door to a lot more companies and Universities to do early development capitalizing on the design kits that have already developed. “There is enough interest already to fill 2-3 reticals with parts “ According to Patti “Tezzaron is a arranging for the Si through Global foundries and will do the assembly, the backside metals and Cu bonding “. By now you have seen the major announcement that Elpida (Japan), UMC (Taiwan) and Powertech Technologies (Taiwan) have formed an “alliance” to speed up the development of 3D chips at the 28 nm node (link). This makes so much sense in so many ways. Elpida has had several recent announcements indicating a strong desire to be an early player in 3D [ see PFTLE 101 “Optimism vs Reality; Semantics or Lost in Translation”, 10/11/2009; PFTLE 97 “Ginkgo Biloba”, 9/12/2009; “Elpida Preparing for 3D Commercialization” Semiconductor International, 3/30/2010]. UMC, meanwhile has been very silent about their 3D activity except for joining the ITRI Advanced Stacked- System Technology and Application Consortium (Ad-STAC) [ see PFTLE 99 “3D IC at ITRI”, 9/24/2009 ]. UMC certainly needed to get more press for their activities in order to counter the attention being paid to rival TSMC [ see PFTLE 117 “On Copper Diffusion, Gettering and the Denuded Zone” 02/06/2010; PFTLE 110 “3-D ASIP Update: TSMC & the OSATs”, 12/23/2009 ]. Takao Adachi, CTO in charge of new technology development, has stated that ELpida wants to use it’s 3D technology to “expand beyond its DRAM business and supply systems solutions developed by stacking memory with Rf sensor and logic devices that would come from partner companies” [ see “Elpida Preparing for 3D Commercialization” Semiconductor International, 3/30/2010]. This announcement brings those goals closer to reality. Memory on Logic will enable a large number of I/O between logic and DRAM which increases the data transfer rate and reduces power consumption. Such products will be based on UMC’s foundry logic, Elpida’s DRAM and Powertechs assembly technology. DIGITIMES reports that PTI has been discussing TSV technology with Elpida for several years and it is speculated that this alliance could lead to a partnership arrangement in the future [ link]. To meet this tight time line IFTLE boldly predicts that 3D interposers it will be used to mate the UMC logic to the Elpida memory. Recall Elpida has extensive background on interposers from their previous work with NEC. 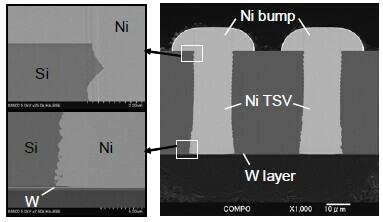 [ see PFTLE 28 “NXP Proposes Passive Integration in 3D IC Stacks”, 04/13/2008 ] We will see what really happens shortly. You can be sure you will see updates in IFTLE. Leti has announced that it has opened a complete 300 mm fab extension dedicated to 3D applications. Equipment instillation will continue through the end of the year and an inaugural event is planned for Jan 2011. The line includes lithography, metallization, etching, dielectric dep, wet etch and packaging which will be available for Leti customers and partners. In IFTLE 2 “Adv Pkging at 2010 Las Vegas ECTC”, June 2010, I reported the speculation that a TSV containing product would be introduced into their server line. According to the rumor, the product would come off the R&D line. There are also multiple reports that that you should be aware of, IBM will divest its fab business entirely. On May 11th EE Times reported that “rumors were rampant” that the IBM Microelectronics Division was once again up for sale and that GlobalFoundries was the reported suitor. Boris Petrov, former director of strategic marketing for Chartered has reported [link] that the IBM hardware business currently accounts for ~ 10% of their yearly income. He sees IBM selling their fabs to Globalfoundries (backed by Abu Dhabi finances) and retaining their R&D operations. Under his scenario IBM would provide process and materials engineering for the worldwide GlobalFoundries fab operation. More if these rumors continue to develop. For all the latest on 3D IC and advanced packaging stay linked to IFTLE……. Design Automation and Test Europe (DATE) was recently held in Dresden. You may recall, last year DATE held a major track on 3-D integration [ see PFTLE 75, “Nice DATE”, 05/09/2009] . Chairs Marinissen, Guillou and Van der Plas repeated the track this year with similar excellent results. At the 2010 DATE Cheng-Wen Wu from ITRI gave a plenary presentation on “What We Have Learned from SOC Is What Is Driving 3D Integration” Wu reiterated what we have seen previously [ see PFTLE 121 “IC Consolidation, Node Scaling and 3D IC”, 03/03/2010 ] in terms of cost becoming a major obstacle in order to moving forward with future nodes. When looking at the techniques being developed to ensure 3-D yield, the following slide is a great pictorial to how 2/4 redundancy gives much better odds of yielding a 3D stacked structure than simple TSV doubling. At Semicon 2009 Ric Borges of Synopsys reported that Synopsys was ramping to provide tools in time for market adoption of 3D IC integration. [ see PFTLE 90 “MCA Delivers 3D Brightspot at Semicon”, 7/31/2009. • non-scalable due to vertical heat path. They ask the question of whether extra TSV are really needed for thermal reasons and if so when should they be added since the thermal hot spots are really not known until the routing is complete. they conclude that the maximum temperature decreases as TSVs are inserted, however, the effects saturate quickly. The proximity of thermal TSV arrays to hot spots is more critical than array size. For close proximity arrays size matters but benefits from increased array size saturates quickly. 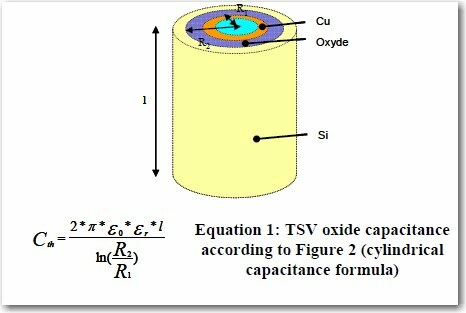 It is best to place thermal TSVs in array format to minimize area penalty, close to hotspot to maximize heat conduction. 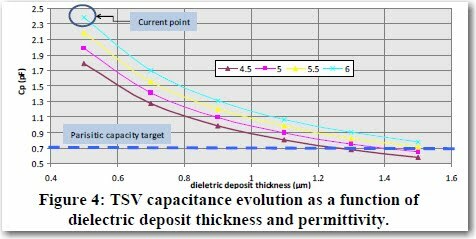 It is the boundary heat transfer coefficient that dictates the steady state temperature of chips, not the amount of TSVs. 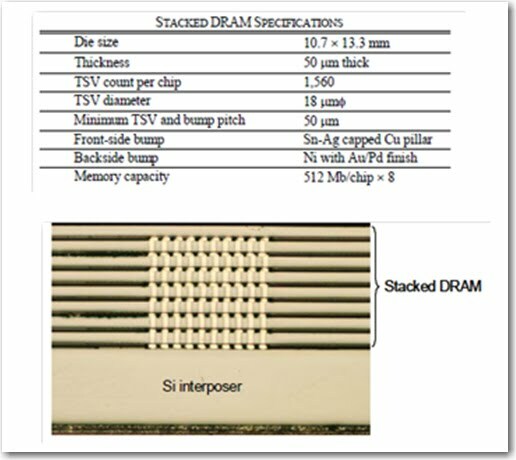 Is the key success factor for testing of 3D stacked devices, since contacting 3D circuits has several limitations (see case study later) Without considering test during design phase it will be impossible to perform effective tests on 3D stacked IC’s. Non contact probing is limited to pitch due to antenna issues. You are currently browsing the Insights From Leading Edge blog archives for July, 2010.